Ever since Christmas, I have been in small project mode. I just don’t want to take on another huge project right now even though I have a lot of big goals for this year. But I do have a lot to share! Today, I have a simple tutorial on getting a white washed look by layering paint. Many months ago, I picked up these cute oars for $3 from a local yard sale. Have you ever been in the store and thought to yourself, “OMG, That is EXACTLY what I have been looking for!…except it’s the wrong dang color! !” Happens to me all the time. Sometimes it’s fixable, and sometimes it’s not, and sometimes you don’t want to pay full price for something that needs fixing. However, for a $3 oar, yep, I’ll happily fix that! I have tried a few different techniques for whitewashing and I have come to the conclusion that practice makes perfect. I am not a fan of the white wash that is trying too hard. Like you can tell where every brush stroke started and ended and slopped all over. I definitely recommend using some scrap wood first until you get the results you want. Every piece is different and a small change in texture can create different results. There are several techniques for white washing, including a cerused finish like this which is really beautiful.Whether you white wash paint or stain, the instructions are essentially the same. Paint or stain the base color of your choice. Allow to dry completely unless you want some of it mixing into your wash and dulling the results. Stain may still mix a bit into chalk paint, but you will get an antiqued look. Start by mixing 1 part water to 6 parts of white paint. Tip: For more contrast such as pictured above, use less water. For a more even and ghostly look, use more water. I don’t recommend more than a 1:2 ratio because it can get really messy and hard to control drips. 3. Using a t-shirt or small cloth, dip into the paint mixture and gently wipe onto wood working in small sections. Use a second dry cloth to wipe off and push the paint into the creases or texture of the wood. Work in one direction and try to keep moving before the previous paint dries. A paint with a longer working time is good. For added depth or if your working with a piece that does not have a lot of texture, I recommend using either exclusively using the dry brush technique or hitting it with a dry brush after white washing with a rag. By dry brushing, I mean you dip your brush in the paint and then wipe 90% of it off on a paper towel. You still want to use the watered-down paint for this. Undiluted paint and dry brushing aren’t friends. It often leave odd marks and doesn’t look smooth. White Washing techniques seem to work best with matte paint. Personally, my favorite matte furniture paint is Fusion Mineral and they have several whites to choose from. You can see a comparison of their white colors here, but Casement is generally their purest white color. I have also used Annie Sloan, and DIY chalk paint (1 cup latex paint plus 2.5 tbsp plaster of paris + 1.5 tbsp cool water) that works pretty good if you water it down more. All in all, I am pretty happy with how the oars turned out. Maybe when I am ready to take on a larger project, I will finally get around to that dresser. Oh well, more goals for this year. Do you like the whitewashed look? It has so many applications from accents to whole walls. Looking for More Furniture and Painting Projects? We have lots of inspiration! Or see all of our Makeovers here! Thank you for the whitewash with chalk paint tutorial. It was helpful. Thank you for stopping by! Good luck on your project. Thank you for the post on the tips and tricks for whitewashing with chalk paint. 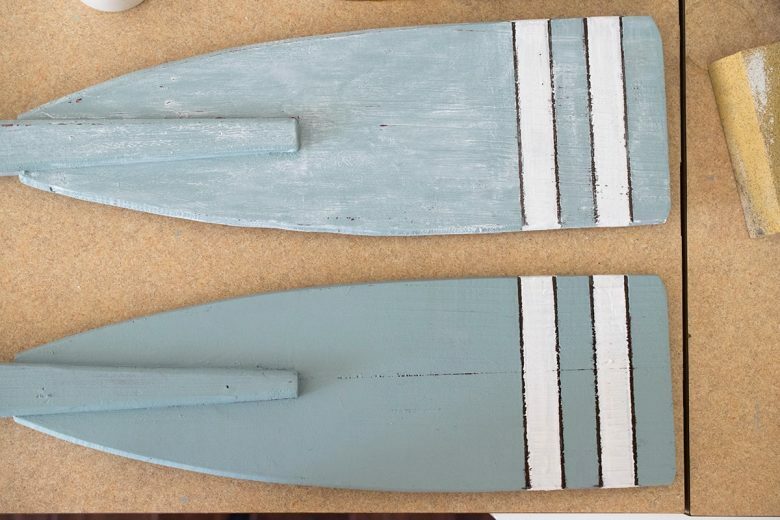 I like how the oars turned out and they look great even without the dresser being painted. I haven’t tried using an old t-shirt or cloth to paint so I will have to try that next time.